Give your home an affordable DIY makeover with this Rocky Mountain Cordovan laminate flooring by Manhattan & Co. With its simple locking system, panels quickly snap together for easy installation. Matching transitions and quarter rounds also make it easy to incorporate this new flooring style into your home. 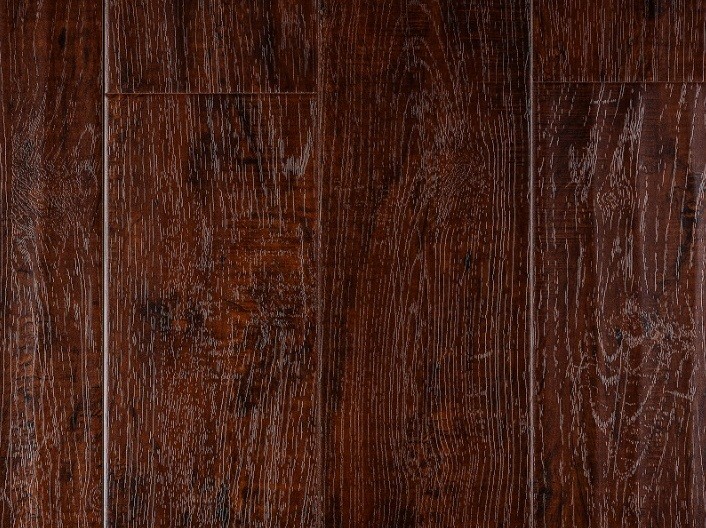 This flooring features a beautiful dark wood grain that's hand-scraped and embossed for an ultra-realistic look. Don't be surprised when your guests mistake them for hardwood floors; only you'll know that you actually got a great deal by opting for easy-care laminate flooring instead. Plus, you'll have a 30-year warranty to back up the superior durability and wear-resistance of your laminate floors. Choose Rocky Mountain Cordovan Locking System laminate flooring to add style and sophistication to your space. If you have any questions about our products, don't hesitate to contact our helpful and friendly team of flooring experts for assistance.